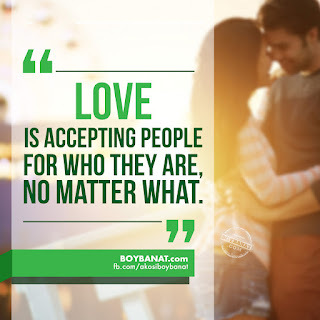 Boy Banat, vast collection of pinoy quotes, pinoy pickup lines, pinoy love stories, inspirational text quotes, christian greetings, bob ong quotes, love stories, celebrity jokes, pick up lines and even informative news. Boy Banat also provides array of pinoy jokes and banat lines to share with your family, loved ones, friends, and special someone. Boy Banat encourage to our viewer and readers contribute more pinoy quotes, pinoy jokes, pickup lines, stories and even your latest article you want to publish as long as it yours or credit the rightful owner. You can also share it with us and publish it, just email your messages to boybanatweb@gmail.com. All quotes, jokes and pickup lines and some images at boybanat.com belong to the right full owners and are not necessarily the property of this site.